Update: 2015.07.02 – Happy 4th of July! 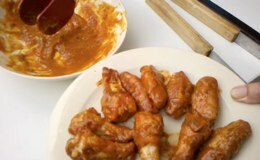 Wings, grilled and slathered in a bbq sauce are a classic backyard recipe for celebrating the Fourth of July! Simply substitute your favorite mustard-based BBQ sauce – mop on generously, and enjoy a new and different tangy take on grilled wings. 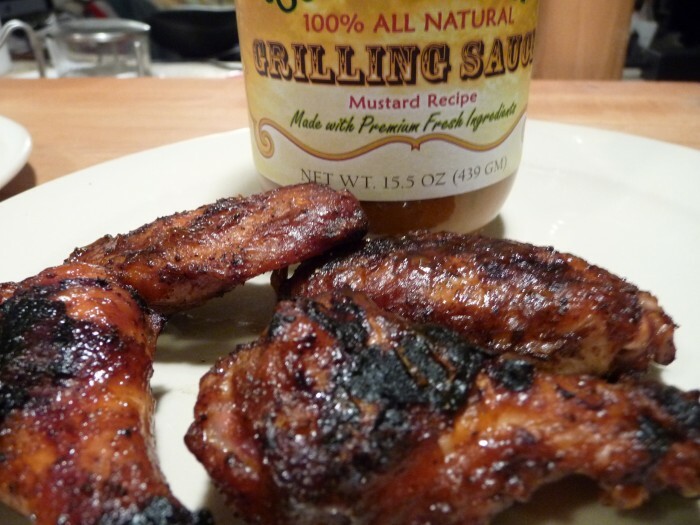 The mustard based BBQ sauce will add some new zing to your wings, and taste delicious. And for those new to this “game”, the wings will NOT taste like mustard. Rather they well be tangy, zingy, vingegary, and savory. You’ll be surprised! What are smoke grilled wings? It’s simple, you are slowly grilling your wings with the addition of smoke by adding chips or chunks of your favorite wood. 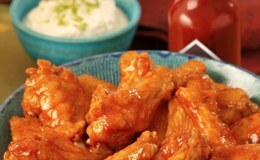 Not only do these wings work great with your everyday buffalo style sauces, but this method excels when coating your wings with any barbecue sauces. In this case, we are using a superb mustard based BBQ sauce from Chef Mike Espey’s Country Chef Grilling Sauce line. We originally created this video for our friend Robyn Medlin and her GrillGirl.com blog. You will also get a great look at the Craycort Cast Iron Grill Grates for a Weber Kettle in this video. Available for Webers, Big Green Eggs, and Kamado style grills and smokers… our full review of the Craycort will be coming up this Spring. There are other great mustard based BBQ sauces out there – some better than others. We loved the Country chef Grilling Sauce blend. We also really liked the first mustard based BBQ sauce we tried from Reverend Marvin’s. The second day of our Week of Wings III series continues with 3 different wing recipes featuring 3 Tabasco sauces, as created by Bravo’s Top Chef Masters winner Floyd Cardoz. Chef Floyd’s re-imagined Buffalo wing recipe will be served at Maxim Magazine’s annual, celebrity-studded Super Bowl party in Indianapolis, where football fans, pro-athletes and celebrities alike will feast on Chef Floyd’s wings.